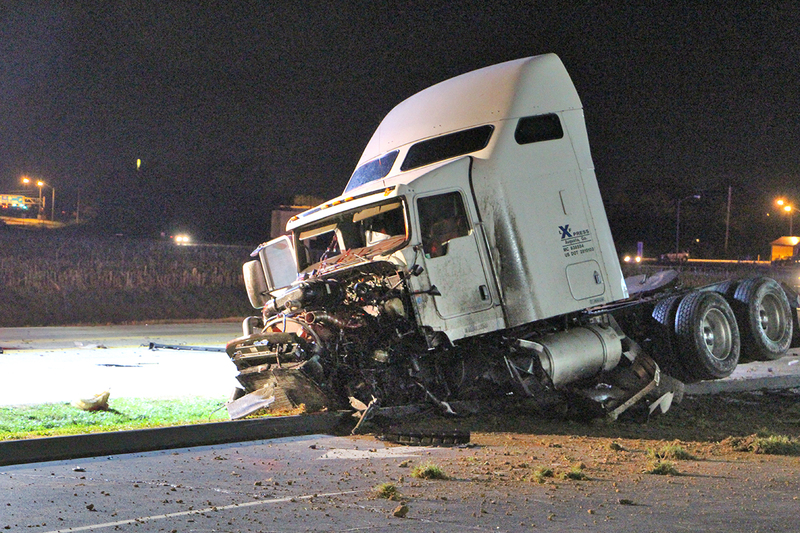 O’FALLON – A traffic accident involving a semi-truck and multiple cars claimed one life Tuesday night. According to a statement from the O’Fallon Police Department, at approximately 9:11 p.m., the O’Fallon Public Safety 9-1-1 Communications Center began receiving 9-1-1 calls reporting a semi-truck traveling at a high rate of speed eastbound in the 700 block of West Highway 50. The emergency calls continued with citizens now reporting either a domestic disturbance or some sort of accident involving a semi-truck in the 100 block of East Highway 50. One of the callers reporting the 100 block of East Highway 50 incident stated a female claimed to have jumped from the semi. As O’Fallon Officers attempted to investigate the allegations and locate the semi-truck, more 9-1-1 calls were received regarding a multi-vehicle accident in the 8600 block of East Highway 50. The first arriving O’Fallon Patrol units found an accident scene involving four passenger vehicles and one semi-truck. The accident scene was approximately ¼ mile in length and included all three traffic lanes and both the north and south shoulders. One passenger vehicle was overturned and resting in the ditch on the south side. Three additional vehicles sustained damage from flying debris caused by the impact. The sole occupant of the overturned vehicle was deceased on the scene and was later identified as Cheryl O. Culver, 67 years of age, of Summerfield, Illinois. Three other individuals from the traffic crash, including the truck driver, were transported to a local hospital with non-life threatening injuries. The female from the 100 block of East Highway 50 was subsequently located and also transported to a local hospital with minor injuries. The semi-truck driver, who is from Augusta, Georgia, remains in O’Fallon Police custody pending formal charges. Illinois State Police Traffic Re-construction team and the Metro East Crash Assistance Team continue to investigate the crash scene. The O’Fallon Weekly will have more information as it becomes available.